Let’s face it, your Kenmore dishwasher is probably the most convenient appliance you have in your Dallas-Fort Worth area home. Of course, anyone can wash dishes by hand, but who has time for that and who really wants to? When you start having problems with your dishwasher, don’t waste time trying to fix it yourself. Water and electricity can be dangerous for people who aren’t experienced with repairs, so your safest—and most efficient—option is to contact a Kenmore dishwasher repair professional. If your Kenmore dishwasher decides to stop working, your dishes will either pile up in the sink or you’ll have to spend time washing them by hand. Neither option is ideal, and trying to repair the dishwasher yourself isn’t either. Many things can go wrong when you try to fix your dishwasher if you aren’t careful, so put your trust in your Appliance Champion or your local Kenmore dishwasher repair technician expert instead. 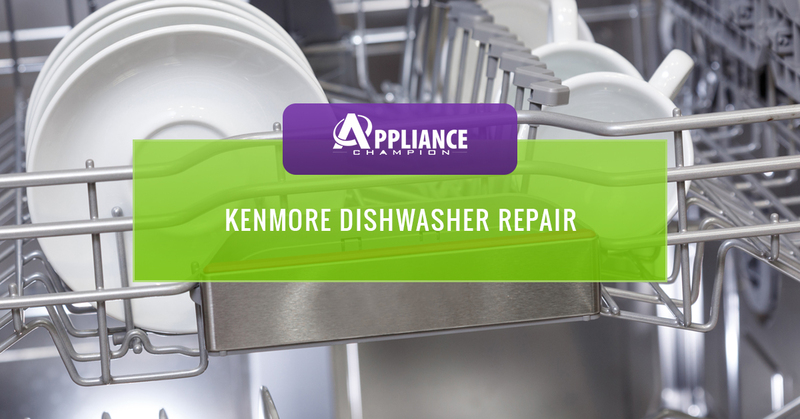 Appliance Champion is experienced in repairing Kenmore dishwashers, so there isn’t a problem we haven’t seen. Give us a call as soon as you notice yours in your Dallas-Fort Worth home is going out. Not only will we repair it for you, we will also give you tips on how to prevent further issues down the line. So what does “Top Rated Local®” mean? For other businesses and even our competitors it could mean a lot of things. However, with us you can assume a few things. You can assume that you will get timely service—same day service and even emergency service if needed. Also, every Kenmore dishwasher repair tech that steps through your door is factory-certified, equipped with the proper tools, and will be completely transparent with you about the repairs and parts needed to get your appliance up and running as soon as possible. We provide our Top Rated Local service to clients in the Keller, Southlake, Grapevine, Colleyville, Bedford, North Richland Hills, Arlington, and Saginaw area and beyond.Call Appliance Champion today!